created ‘Ancient One’ in early January of 1998. 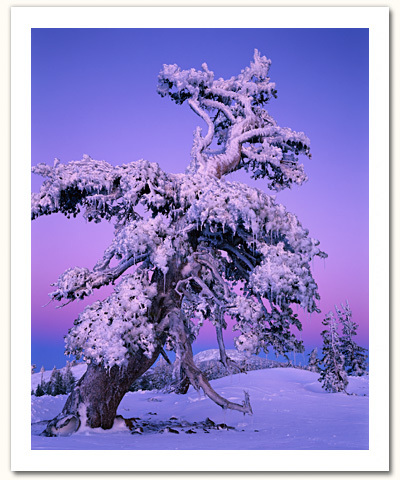 This ancient Whitebark Pine grows on the rim of a cinder cone that rests at the base of Mt. Bachelor, in the Cascade Mountains of Oregon. My primary reason for photographing this volcanic landscape was to capture an image of the Three Sisters Mountains (please see ‘Faith, Hope and Charity’) for a 9 foot back lit mural a national corporation had commissioned me to create. While scouting for that image, I spotted this Whitebark Pine from afar. It was like a beacon drawing me to the crater rim. I’ve been captivated by ancient trees for a long time. The most beautifully sculpted Whitebark Pine specimens grow on mountain ridges buffeted by the most intense wind and weather imaginable. This location gets so much wind that the snow has a difficult time sticking to the ridge, as witnessed by the rock you see at the base of the tree. In winter, I access many of my subjects on cross country skis. After spotting this tree, I skied to the crater rim and circled it, observing its exquisite character from every angle. I soon observed something that got me very excited. The most beautiful view of the tree also faced west with no obstruction to the horizon. This meant, during the last hour of daylight the tree would take on a dramatic glow. After examining the tree, I was immediately drawn to another Whitebark Pine growing horizontally across the hillside with a spectacular view of the Three Sisters and Broken Top Mountain. This was just the image I was looking for to complete the mural project. This image later became my limited edition print titled, ‘The Ancient Ones.’ After finding other wonderful subjects, I decided to come back another day when the conditions would provide more snow and ice on the trees. I skied down the mountain in the dark, anticipating the great images to come. Over the next week I watched the weather closely, and finally saw the conditions I was looking for. My excitement level was high. As I climbed with 35 pounds on my back, my lungs protested the thin,15 degree air. Still, I arrived at the top with plenty of time to spare and began setting up my equipment. This was it! I had to focus on my primary goal first, that being the mural image. The conditions were perfect. I waited for what seemed like an eternity for the light to begin coloring the scene with alpenglow pinks and purples. When the time was right I began exposing film, knowing I only had a couple of minutes to work. Success! When I was finished I looked up the hill to my right and saw this spectacular alpenglow lighting up the ancient Whitebark Pine. I grabbed my camera and literally ran up the hill scrambling to get set up. I had to back up with my torso resting on the trunk of another tree to get the composition I wanted. I completely surrendered to my instincts. There was no time for any other way. At this moment, I created ‘Ancient One.’ Within 2 minutes the color in the sky was fading and I stopped photographing. With a huge smile on my face and a warm feeling in my heart, I skied down the mountain anticipating the results of this special day.